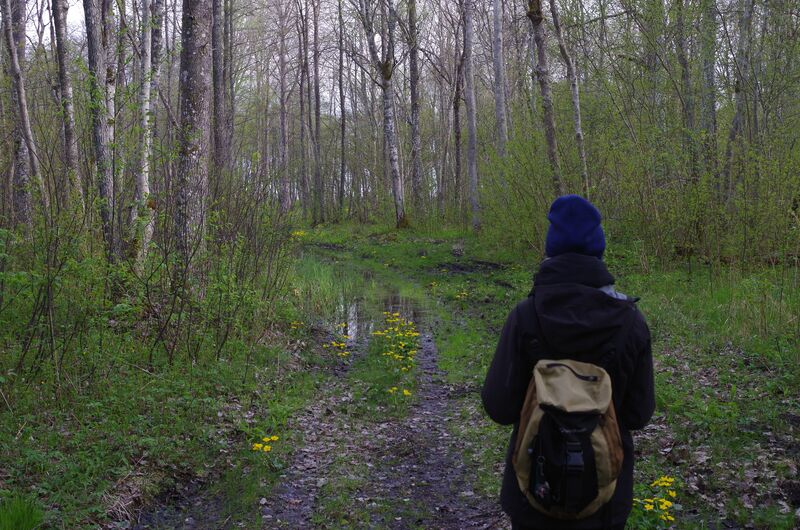 Environmental Studies Certificate Program student Julie Weissmann walks through the Estonian forest. Photograph: Robert Emmett. I took this photograph of one of our Environmental Studies Certificate Program students, Julie Weissmann, walking at the head of the group of participants in the Animals in Transdisciplinary Environmental History summer school near Haapsalu, Estonia. Biosemiotician Kalevi Kull had just described the mixture of birdsong in the spring forest as the “Estonian symphony” when we came upon the flooded section of path. Around one kilometer ahead through the trees is the Baltic Sea, where we later observed oyster catchers, avocets, terns, and many other wading birds in a protected coastal reserve. The high latitude made for long periods of daylight—from earlier than 5:00 a.m. until around 10:00 p.m.—for field observation after our sessions ended.